The Big Sea: Let's Take Some Risks! There are quite a few things that are going on in my life that are exciting and scary at the same time. And, one thing about new things is that we must be vulnerable in order to experience the joy that I know that we all desire. After reading Daring Greatly, I was so excited and thought that I was ready to take this vulnerability journey. 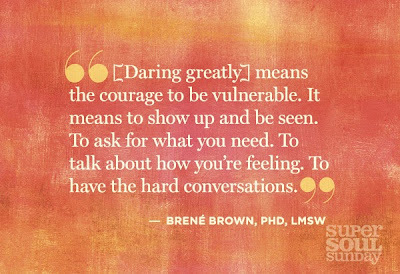 However, coming face to face with vulnerability, like for real, is not for the faint of heart at all, but I know, without a doubt that it is so worth it.